Yes, when I picked up Pagan Britain - the latest book by the dearly loved pagan institution – I couldn’t help but wonder what cornerstones of my belief he would thoroughly excavate and find to be just some mock facade added at a later date. But,while Stations of the Sun destroyed the concept that in the glorious past there had been some unified countrywide calendar of pagan seasonal festivals known as the Wheel of the Year, and The Triumph of the Moon shocked many Wiccans and witches by showing that their religion wasn’t ancient, Pagan Britain isn’t like that at all. Ronald Hutton’s new book looks at the evidence and discusses just how wide the interpretation of it can be. What the book does, in detail and depth, is examine the archaeology and written accounts of the religious beliefs and practises of the people who have lived in our islands from the pre-history of the Old Stone Age to the coming of Christianity. It shows that many different theories are possible, and charts how these have changed over the centuries and continue to change in our current time. In his conclusion, he reiterates the point made throughout the book, that the relics of the past have “an ability to defy full understanding and confident interpretation”. Sensationalist TV programmes might like to give definite answers to questions about what the builders of Stonehenge or the Druids or even the Vikings got up to, but those definite answers are only likely to get overturned the next year when the next expert gets interviewed. Pagan Britain's strength lies in the meticulous way it covers the wide range of evidence that the ancient past has left for us and also examines different theories and the context in which those theories were put forward. Added to that, Ronald Hutton’s engaging style of writing means the book is very easy to read, despite the book's length - nearly 480 pages. I was sent this review copy a couple of months ago, and picked it up to read a few pages whenever I had the time. I found the book both fascinating and enjoyable, but it still took me a long while to finish and that’s why this write-up is only being posted now. There is no way that I can summarise all the points Ronald Hutton makes in just a short blog post. What I will do instead is say that if you want to examine the evidence our pagan ancestors have left behind in the British Isles, this is the book to read. 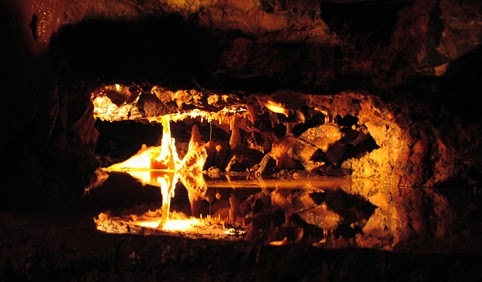 From the earliest human remains found in the Paviland caves and Gough’s Cave in the Cheddar Gorge (pictured top) through to the great monument and stone circle builders; the time of the Celts, the Romans, the Anglo-Saxons and the Vikings – Pagan Britain covers the lot. At the end Ronald Hutton looks at the legacy of British paganism and takes another look at the history of witchcraft and traditions of magic, clarifying some of the material from his earlier books. This really is a must for any modern pagan’s bookshelf and is worth taking the time to read. Pagan Britain. is published by Yale University Press. You can see more at: http://yalebooks.co.uk/ and you can order Pagan Britain via Amazon, in hardback and Kindle format. I read your blog with interest and would love to ask you a few questions for a project I am working on if you wouldn't mind? Be great if you could email me at alphabetbritain@gmail.com and I can explain more about the project.